The Funky Felter: Here's a chance for some fabulous fiber art freebies from Craft Gossip's Felting Blog! Here's a chance for some fabulous fiber art freebies from Craft Gossip's Felting Blog! 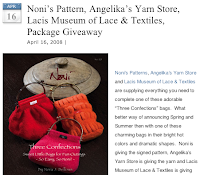 "You get everything to make a Noni purse, the pattern, yarn and purse frame. Take a look see they are darling a quickies to knit up. Tell all your friends too! This will be our self-involved giveaway. Just leave a comment and tell why you must have this pattern and yarn and with what outfit you would carry one of these three bags and why you want it just for Me-Me-Me!" You can find much more information about this giveaway special in her original blog post so please go visit and read up on how to have a chance at this great giveaway! **The image is screen shot from CraftGossip.com's felting blog. I am in no way affiliated with Craft Gossip or this special giveaway offer. I just think it is nifty!